New Winter 2018: Help the kids keep special memories alive with one of these beach ornaments personalized with their names and more! 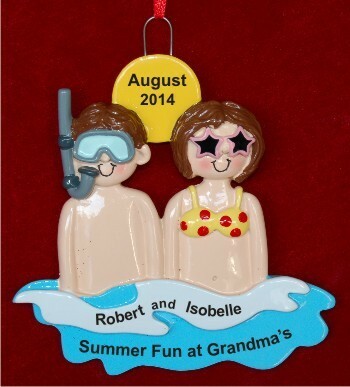 The at the beach siblings personalized Christmas ornament stars a guy and a gal ready to enjoy the waves and what lies beneath them. As personalized siblings ornaments, yours will arrive with custom details painted on by hand in a font more stylish than shown to create a keepsake that is one of a kind. The kids in the water personalized Christmas ornament is a fun way to remember a trip to the lake or ocean, and it ships in our exclusive velvet gift and storage pouch.